Two British tourists barred from entering U.S. over a twitter joke to 'destroy America'. Two tourists from the U.K. were detained and barred from entering the U.S. over a twitter joke. 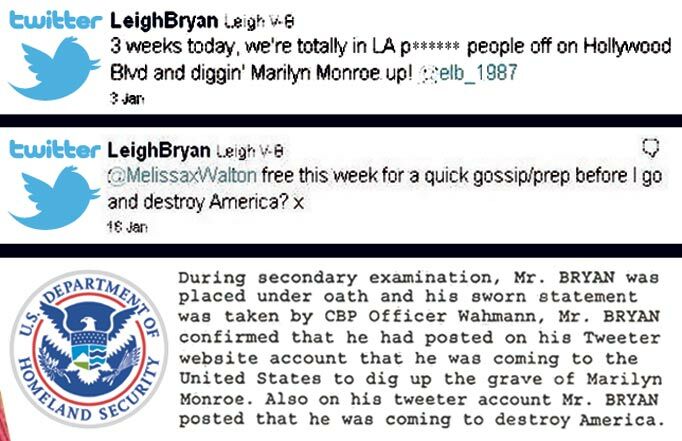 Leigh Van Bryan, a 20-something Irish national currently residing in Coventry, U.K. was placed on a “One Day Lookout” list by the Department of Homeland Security for posting a suggestive message to ‘destroy America’ and ‘diggin’ up Marilyn Monroe’. Bryan and his friend Emily Bunting flew to Los Angeles for vacation but were welcomed by Homeland Security Officials. Both were questioned and detained for 12 hours before they were deported back to the U.K.
“They asked why we wanted to destroy America and we tried to explain [‘destroy’] meant to get trashed and party,” Bryan said. Monroe up!” was actually a quote from the American comedy show ‘Family Guy’. The two were denied entry with Bryan charged with ‘intending to come to U.S. to commit crimes’ while his companion, Bunting was charged for travelling with Bryan.